Time To Dismantle Costly CPP? 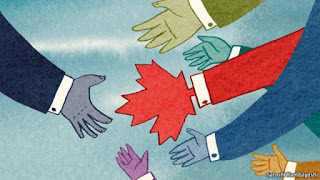 Proponents of expanding the Canada Pension Plan, or launching a similar large-scale retirement vehicle in Ontario, often tout the element of lower costs through economies of scale. But a new study from the Fraser Institute says the CPP has no clear cost advantage over other large public sector pensions. The study by Philip Cross, a former chief economic analyst for Statistics Canada, compared the total costs of CPP and five large public sector pension plans in Ontario. The author says his study is unique because it looked at a complete picture of both investment and administrative costs. The study, to be released publicly on Tuesday, concludes that CPP, the largest plan scrutinized over the period from 2009 to 2014, was in fact the costliest as a percentage of assets. “Specifically, the CPP with $269 billion in assets had the highest average cost-to-asset ratio at 1.07 per cent during that time,” the Fraser Institute, a research think-tank, said in a statement. 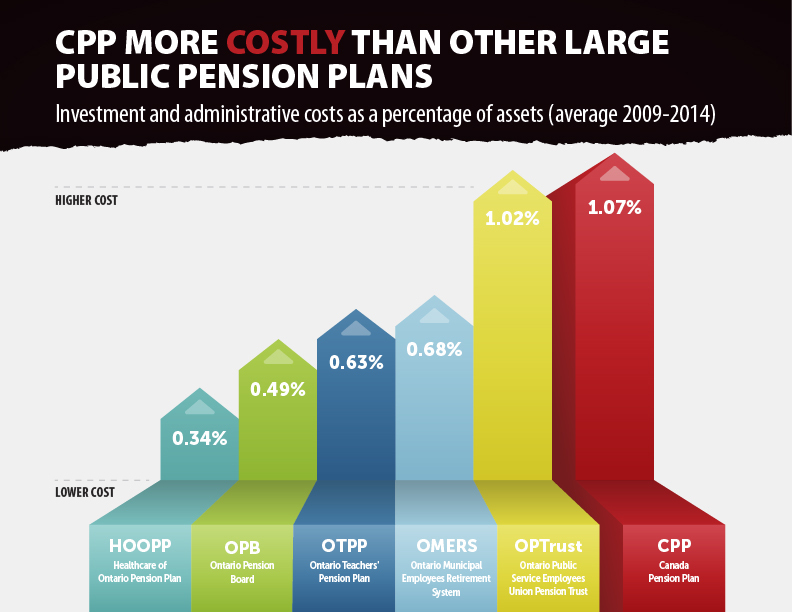 Furthering the notion that size does not correlate with cost, the study concluded that the Ontario Teachers’ Pension Plan — the second-largest fund, with $154 billion in assets — was only the fourth costliest, with an average cost ratio of 0.63 per cent. The study looked at and dissected two cost categories: investment and administrative. The smallest fund in the study, OPTrust — with just $17 billion in assets — was found to have the highest average investment costs as a percentage of assets. This was followed by CPP, with the second-highest investment costs. 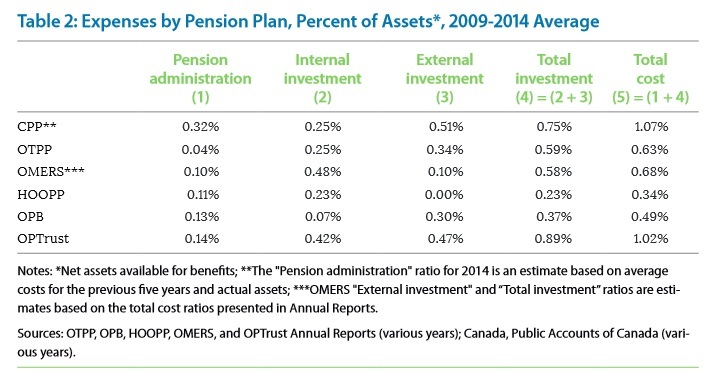 Another of the smaller funds scrutinized, the Ontario Pension Board, had one of the lowest average investment costs. 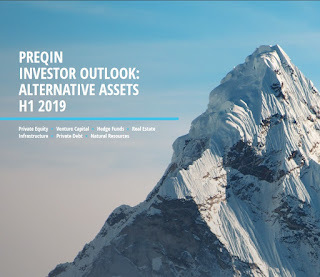 Cross speculated that fund growth through asset accumulation might actually raise costs, since the complexity of implementing investment strategies calls for more — and costly — external expert counsel. Debate over expansion of the Canada Pension Plan has raged in recent years, with some experts arguing Canadians aren’t saving enough for retirement and need a boost from the national public pension. Ottawa and the provinces came close to agreeing to enhance CPP a couple of years ago, but fears about the strength of the economy derailed those efforts. The government of Ontario responded with plans to launch its own provincial pension plan, the Ontario Retirement Pension Plan (ORPP), which could be rolled into an expanded national plan should that be embraced. The Fraser Institute has weighed in on the CPP and ORPP before. A study published in July suggested that ramping up government-driven mandatory retirement savings programs could lead to less voluntary savings, resulting in no overall impact on how much Canadians have to fund their golden years. The Canada Pension Plan (CPP) is more costly than five public sector pension plans, according to a new report by the Fraser Institute. 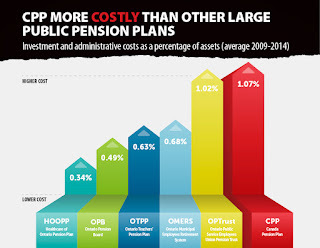 The report compared the total costs, including investment and administrative of the CPP with five large public sector plans based in Ontario, including: the Ontario Teachers’ Pension Plan (OTPP), the Ontario Municipal Employees Retirement System (OMERS), the Healthcare of Ontario Pension Plan (HOOPP), the Ontario Pension Board (OPB), and the OPTrust. It found that the CPP, which is the largest plan with $269 billion of assets, had the highest expense ratio at 1.07% of its assets on average for the whole period between 2009 and 2014. The OTPP, the next largest plan at $154 billion of assets, had the fourth highest average expense ratio (0.63%). “In fact, there may be diseconomies of scale for larger public pension plans because of the complexity of implementing their investment strategies, which include contracting out for external experts – a practice that has become increasingly popular, with plans investing more in non-traditional assets such as real estate, infrastructure, and private equity,” said the report. The Fraser Institute put out this press release on comparing the costs of the Canada Pension Plan with public pension plans in Ontario. You can read the full report here. Before I tear this study and its authors to pieces, let me first commend them for at least attempting to shed some light on costs at Ontario's public pension plans. When it comes to public pensions, I'm all for more transparency on costs, fees, leverage, benchmarks, compensation, diversity, and anything else that Canadians deserve to know about. In short, I believe that Joe and Jane Maple Leaf deserve to know a lot more about what is going on at Canada's public pensions, as well as financial markets, which is why I started this blog back in June 2008, much to my personal demise (not that I had much of a choice!). I have no problem taking on Canada's Top Ten, shining a light on their activity, but when I read these studies on the CPP from the Fraser Institute, I can't help but wonder who funds this nonsense and what is their ultimate political goal? Just so you know, I have experience working as a senior investment analyst at two of the largest Canadian pension funds, the Caisse and PSP Investments, but I've also worked as a fixed income analyst at BCA Research, an economist at the National Bank, and as a senior economist at the Business Development Bank of Canada and then Industry Canada. All this to say, I know the Fraser Institute all too well. It was recently ranked as the top think tank in Canada by the University of Pennsylvania, but it was always a right-wing think tank with an axe to grind against big government or anything else perceived to be big government (like Big CPP even though it's a Crown corporation that operates at arms-length from the government). One of the authors of this study, Philip Cross, has extensive experience at Statistics Canada, an organization which I respect, and then worked for the Macdonald-Laurier Institute. He is also a member of the Business Cycle Dating Committee at the CD Howe Institute. But for all his credentials and experience, Cross has an axe to grind with the Canada Pension Plan and he has even written articles in -- you guessed it, the National Post!! -- arguing we should forget talk of a pension crisis, Canadians are very well protected in their retirement. Really? That's news to me because I've been arguing all along that we need real change to Canada's Pension Plan and that now more than ever, our politicians need to stop dithering and enhance the CPP once and for all. And this despite the crisis in the Canadian economy which will more than likely usher in negative interest rates here just like in Japan and elsewhere. This is all part of the new negative normal and a period of prolonged ultra low rates which are here to stay as long as the deflation supercycle keeps wreaking havoc on the global economy. This too is why I want our political leaders to get on to enhancing the CPP as soon as possible and finally realize the brutal truth on defined-contribution plans: they aren't working and will condemn millions of Canadians to pension poverty. This is why unlike the Fraser Institute, I welcome Ontario's "Wynning" pension strategy and think it's a real shame our political leaders are once more squandering a golden opportunity to enhance the CPP once and for all. My first criticism of this study is it's comparing apples to oranges. Apart from PSP Investments, which is growing fast and has a similar profile to CPPIB (but still a lot smaller), there's is nothing like our national pension fund in Canada (the Caisse is huge but it manages money of mature Quebec pension plans which pay out more than they receive in contributions). How can you compare CPPIB, a national pension fund which is growing fast, to smaller Ontario plans which cover only a small subset of the Canadian population? This is just silly and doesn't take into account CPPIB's mandate, challenges and advantages which are unique to it. It's one thing managing $20 billion, $50 billion or even $150 billion, but when you're in charge of $270 billion and growing fast, you simply cannot take the same approach that others take and your costs will be relatively higher for all sorts of reasons. CPPIB is a global powerhouse which is investing in public and private markets all over the world. 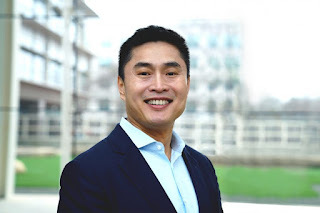 It has over two dozen distinct investment programs (or “business units”) which are global in scope and competition is very intense among some of the world’s biggest investment institutions -- many of which are trillion dollar behemoths. 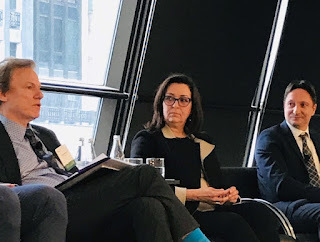 In other words, because of its sheer size and liquidity advantages, CPPIB is engaging in investments activities that others are not doing either because they don't need to or because they can't (too small, too mature, etc). Sure, it's doling out huge fees in private equity, an activity which it does exclusively through external investment partners (fund investments and co-investments with top private equity funds), but it's also engaging direct investments in real estate and infrastructure (the latter is all direct investments). CPPIB is also doing large deals which will better position itself for the future. For example, the acquisition of GE's Antares Capital was the biggest deal of 2015 and one which will benefit the Fund over the very long run. But you need to pay the people running this financing arm and they don't come cheap (still a lot cheaper than doling out huge fees to many private equity funds to do the same activity in the mid market space). The Fraser Institute study talks about "diseconomies of scale of large public pensions because of the complexity of implementing their investment strategies" but it fails to explain the J-curve effect of private equity investments and how large transactions like the GE deal or other big deals might be expensive at first but over the long run, they will lower costs significantly. And just to be clear, when you're the size of CPPIB, you're not paying 2 & 20 to private equity funds or hedge funds. You're paying significantly less than smaller pension funds which can't use their size as leverage. As a cost-conscious organization, we take managing costs seriously. We have a long-standing practice of allocating operating expenses to the investment departments to provide a complete view of the costs associated with generating the investment returns and to encourage cost awareness across the organization. This cost transparency promotes constructive conversations between the departments receiving the cost allocations and the departments allocating the costs that are focused on value for spend and accountability for the expenditures. If CPPIB has high transaction costs compared to other smaller plans in a given year it's because their multiple businesses have pursued many investments over that period of time, not because it's hiding anything from the public. Also, it's important to note performance fees are driven by high performance and they correlate to strong investment returns for the benefit of contributors and beneficiaries. Of course, the rising expense of the CPP’s investment strategy after 2007 could be justified if the rate of return remains high. The problem is that we will not know for years, or even decades, if the rate of return stays elevated. This is especially true of the CPP’s purchase of illiquid assets such as infrastructure, land, and private equity. This strategy presumes first that these assets are mispriced because they are relatively unknown and infrequently traded, and second that the mispricing of assets is on the low and not the high side. In other words, there is a presumption of market failure in price discovery, which large pension funds can identify and profit from better than other investors such as hedge funds. This view may be borne out by a higher return to CPP investments over the decades. Or it may be disproven if returns falter. It is important to remind people that this is an experiment in progress, not the execution of a proven strategy. It is worth remembering that The Economist observed recently that hedge funds once “sold themselves as clever and flexible enough to take advantage of opportunities that conventional fund managers neglected,” but this claim has been disproven over time(The Economist, 2015, August 1: 62). It is also worth noting that high returns earned by the CPPIB’s assets will not benefit its members; the CPP remains largely a pay-as-you-go pension plan, with only 17% funded by CPPIB investments. Since members will not benefit from higher returns, why does management undertake investment strategies that involve more risk? Meanwhile, younger Canadians are already overpaying in terms of the ratio of their contributions to benefits, to compensate for the underfunding before the CPP was overhauled in 1997 (Canada, OSFI, 2013; Godbout, Trudel, and St-Cerny, 2014). At a minimum, the CPPIB has not done a good job explaining publicly why its strategy justifies the additional expense and risk in its investments. Nor has it been shown that an active investment strategy has not distracted management from maximizing the efficiency of both the administrative and investment arms of the CPP, something it promised to do when it adopted this new strategy in 2006. This reference to improving efficiency seems to have been its last utterance on the subject, making it appear to be an empty slogan when maximum efficiency should be the foundation for the operations of the entire CPP, or indeed of any organization entrusted with the public’s money or supported by taxes (it is telling that the lower cost OPB refers to efficiency in its Annual Report, but the CPPIB does not). Developing intricate investment strategies and opening branches around the world may create a more interesting work environment for managers, but this does not guarantee the rate of return that results from higher efficiency and lower costs. Wow, powerful accusations!! Unfortunately, none based on facts and it proves how utterly ignorant and biased the authors are when it comes to CPPIB, its activities and its mandate. In fact, right on CPPIB's website, it clearly states: "CPPIB invests the assets of the CPP with a singular objective – to maximize returns without undue risk of loss. Our investment strategy is designed to capitalize on our comparative advantages." Unlike all those other public pensions in Ontario which the study alludes to, CPP is not a fully-funded plan and as such it can take risks in public and private markets that these other plans cannot or will not take. Its objective is clearly stated, "to maximize returns without undue risk of loss." Period. This is their statutory fiduciary responsibility, a point which seems to have been lost by the authors of this study. Importantly, the notion that higher returns do not benefit members is nonsense. The higher the return, the cheaper the cost of financing the CPP over the long run, which means lower pay-as-you go contributions for Canadians in the future. And unlike what the authors state, CPPIB has been very clear explaining why its strategy justifies the expenses and risks it takes. Perhaps the authors of this study should take the time to read my public blog comments where I go over in detail CPPIB's annual results like when it gained a record 18.3% in Fiscal 2015. What else? Mark Wiseman, CPPIB's CEO, has repeatedly told media outlets that he expects CPPIB to under-perform its reference (benchmark) portfolio, which is one of the toughest to beat, in periods when markets are roaring and outperform it during bear market cycles. 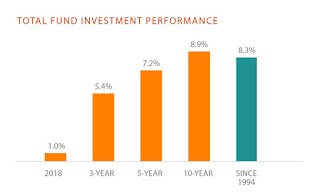 It has delivered a solid 7.3% 10-year annualized rate of return which translates into multi-billions of net investment income over its passive reference (benchmark) portfolio, which is one reason why the Fund is actuarially on solid footing. As far as shifting assets into private markets, this is the strategy that pretty much every large Canadian pension fund has been doing over the last decade but unlike large U.S. pensions, they're investing directly whenever they can, significantly lowering the costs. Only in private equity do they do a lot of fund investments but also co-investments with their partners which brings the total fees down considerably. Also, while shifting assets into private markets isn't without risks, if you read Leo de Bever's comments on why Norway's giant pension fund should invest in unlisted real estate and infrastructure, you would gain a deeper appreciation for this long-term strategy. Will the next ten years be a lot tougher than the last ten years for CPPIB and others to achieve their target rate of return? You bet they will but if I had a choice of having my retirement money in the CPP and other large well-governed Canadian DB plans or some crappy Canadian mutual fund charging me ridiculous fees or even a low-cost index fund which mimics public markets, there's no question I'd choose CPP which is more diversified and a lot more secure. All this to say that this Fraser study comparing the cost of CPP to other Ontario pensions isn't very good as it's full of false and grossly biased claims. I suggest Philip Cross and his co-author talk to a real pension experts like Leo de Bever, Jim Leech, Doug Pearce, John Crocker, Claude Lamoureux, Bob Bertram and Neil Petroff before they ever publish such a spurious study on the high costs of CPP. But let me not be too hard on them, after all, I want to see more studies shining a light on public pensions. And their findings aren't all terrible. They just need to be put in proper context and they need to be openly discussed by real pension experts who actually know what they're talking about. One thing the study demonstrates is why fully-funded HOOPP is one of the best pension plans in the world as it's delivering stellar results at a fraction of the cost of other smaller and larger plans. But here too, you need to be careful as HOOPP's approach cannot be replicated by everyone, especially much larger pensions like OTPP (which does everything HOOPP does and invests in external hedge funds and private equity funds) or CPPIB which is way too big to do everything internally. If anything, this study makes OPTrust look somewhat bad as it has a very expensive cost structure relative to much bigger and smaller pensions but here too, you need to be very careful interpreting costs relative to results. If you look at OPTrust's Annual Report 2014, the latest one available, you will see the Plan is fully funded and it achieved an investment return of 12%, net of external management fees, outperforming the Plan’s 6.2% composite benchmark portfolio. Can OPTrust improve its cost structure by doing more internally? It probably can but the bottom line is it's delivering great results net of all external management fees and it's fully funded allowing it to increase its inflation protection to its members. The bottom line is when most Canadian DB and DC plans are reeling because of the turmoil in global markets, all of the DB pensions discussed in this Fraser Institute study are doing just fine and the last thing we need is to spread more disinformation on why there are several reasons to oppose CPP expansion, including its cost structure. I hope this comment lays all these criticisms to rest but I realize that public pensions, including the CPP and ORPP, are widely politicized and unfortunately, the real pension experts are not the ones being consulted to carry out such studies. Instead, we get academic or quasi-academic hacks publishing spurious studies that are not putting their findings in proper context. If Philip Cross and Joel Emes or anyone else at the Fraser Institute wants to challenge my views, I'd me more than happy to give them an opportunity to reply to my comments (my email is LKolivakis@gmail.com). I'd be even happier if someone like Leo de Bever wrote a study comparing all of Canada's large public pensions. When it comes to pensions, I like reading people who actually know what they're talking about. Below, the Auditor General of Canada Michael Ferguson says the federal government is taking too long to provide disability benefits to some pensioners. Ferguson issued a series of reports Tuesday on government inefficiencies, mostly highlighting the incompetence of Harper's Conservative government. None of this has anything to do with the way CPPIB is run but it underscores the need to have a strong national pension plan which provides secure pensions and disability payments to Canadians who need them most. In the near future, CPPIB will pass its next special examination, and I'm sure it will lay to rest a lot of the misinformation being spread on its supposedly high cost structure. Lastly, I kindly remind all of you that unlike the Fraser Institute, the Leo Kolivakis Institute doesn't have big banks and insurance companies funding it, so if you like reading my comments, please subscribe or donate on the right hand side of this blog and show your appreciation for the best free lunch on pensions and investments on the internet. Thank you and have a great day! Going Nuts Over London City Airport? Cracks in Canada's Pension Safety Net? Ontario Teachers Dumping PE Funds? Canadian Pensions Defy Volatile Markets? Ontario Delays Launch of ORPP? The Death of Manufactured Unicorns? Will Canada Adopt Negative Rates? More on Bridgewater's Radical Transparency? Ottawa Courts Pensions on Infrastructure? OTPP Steps on a German Land Mine? What's Behind The Market Turmoil? 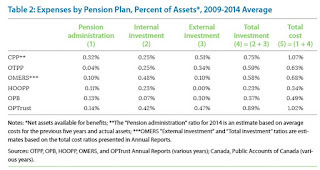 Canadian Pensions Cooling on Infrastructure? Are Banks The Next Big Short? Ultra Low Rates For Years? CPPIB's Focus on Gender Diversity?